Tony Fadell is founder and CEO of Nest, the company that developed the Nest Learning Thermostat and Nest Protect: Smoke + Carbon Monoxide alarm. Prior to Nest, Fadell served as SVP of Apple’s iPod division, reporting to Steve Jobs. He was responsible for creating the first 18 generations of the iPod and the first three generations of the iPhone. Recently, the former Apple employee made headlines when he sold Nest to Google for $3.2 billion. 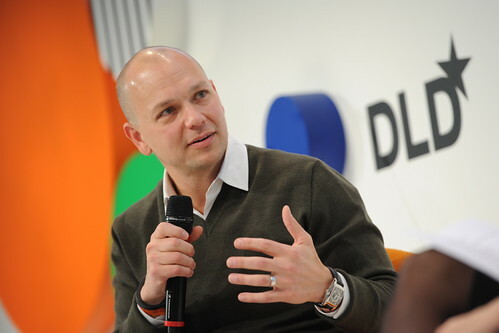 At DLD14 Tony Fadell was only supposed to be a participant, but even before the big news regarding the sale broke last week he was invited to become a speaker. Sitting down with technology correspondent for CNN, Laurie Segall, the session begins with a brief video showing Nest products. The conversation then quickly moves to the sale to Google. "You didn't have to do it, so why go to Google?" asks Segall. Fadell agrees that she is correct. Nest is turning profit. "But our vision was always to change the home," says Fadell. In fact, Nest's long-term goal is to connect everything in a person's home to the Internet. "And the only way to do that was with tremendous scale." Segall then asks what Nest looks like now that it is part of Google. "At the end of the day, Nest will remain Nest," Fadell says. There will still be the same team division, but their efforts will be geared towards building the product they already have for the world. The connected home is still a novel concept for many people. Even those who have it tend to find that the things they expected to happen at the push of a button, end with the bang of a remote. But the concept is still alive and "we have to make this vision a reality point-by-point," says Fadell. The idea that there will ever be some master remote designed that controls everything is not realistic. His decision to join Google was largely a personal one, he answers Segall's question. When he first met with Larry Page and Google's management team he was astounded by the extent of knowledge exchange that was possible between them. "Larry and I were finishing each others sentences. It just made me intellectually happy." Beyond that, he was pleased to find that both he and Page had big, bold ideas that they felt exhilarated rather than frightened by. The merger, therefore, was a "hand in glove fit" according to Fadell. Of course, it is reasonable to be concerned about what a data-driven company such as Google might do with the data collected by Nest products - and Segall rightfully wonders whether soon her thermostat may be suggesting sweaters for her to buy. Fadell assures her and the audience that for the moment the sole purpose Nest devices collect data is to improve their product. Should that purpose ever change, he says Nest "will be very transparent about it". Many start-up stories discussed by press and at DLD are success stories. But for every business that worked, there are dozens that failed – and this applies to Tony Fadell too. Before creating and selling Nest for billions of dollars, Fadell experienced many failures. "I've been starting companies since I was in high school. This is not my first rodeo," he says. These other "rodeos" were with small and big companies, and sometimes falling off the horse cost millions of dollars. "I don't have hair because I've been in the Valley for 20 years!" he laughs. But in the end the name of the game remains perseverance. "Lightning does strike. It just takes a while until it does and it doesn't happen that often". With time running out Segall asks the inventor what he expects to be the next big thing. His answer is that he sees a lot of space for tremendous things to come out of over the next three years for connected cars. As an angel investor who likes to invest in ideas involving deep technology, he finds the challenge of insurable connected cars very exciting. "What keeps you up at night?" Segall asks her last question. "I'm always concerned about getting the best out of our people," answers Fadell. That is why the first thing he said to his team after the acquisition was "don't change", because the reason they got to where they are now, was the way they were.